820ml / 29 oz. THE PERFECT GIN & TONIC "MAXIMA". Perfect for enjoying your favourite GIN & TONIC. Set of 2 Bohemia Crystal Maxima. Product details. These Bohemia Crystal Maxima Glasses are ideal for serving white wine, gin and tonic, or any of your favourite cocktails. Each of these crystal glasses has a balloon-style shape, with a large internal capacity of 820 ml making them ideal for generous servings. Standing just over 20 cm high, with intricate plinth texture at the base, they make a statement on the table or on the shelf. Bought these as a birthday gift for my Dad, who was absolutely delighted with them. Biggest he'd ever seen! And great quality too. Really pleased with the purchase - tempted to buy some for myself too! A bucket not a glass! I obviously didn't read the description closely enough and find the glasses far too big. A single measure of gin hardly covers the bottom! Great if you are happy to drink large measures but too big for me. Having said all that, the glasses themselves are excellent quality the packaging was to an extremely high standard and delivery speedy. A great buy for a fantastic price if this is what you are looking for. Bought these glasses as a gift as had been bought similar and loved the present. These are large, beautifully made glasses with a thin lip which I always think is a sign of a high quality glass. Each glass easily holds a double gin with a full mixer, with almost half the glass to spare. 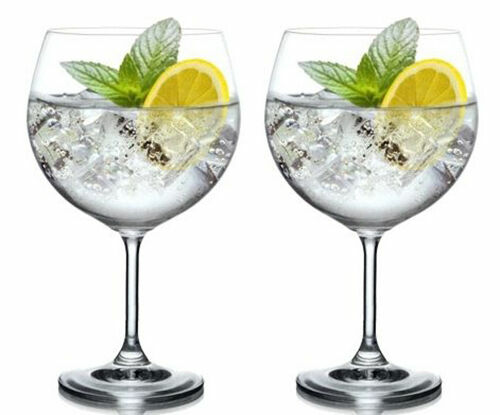 Have bought 3 sets of these, just love them for my daily G&T! My favourite is mint and cucumber and there is plenty of room for everything!